Toyota Australia and its dealers have earned a gold national award from the world’s widest circulation magazine. The Reader’s Digest Quality Service Award 2016 was based on a national reader survey of customer service across businesses and companies in different industries. Toyota achieved a 76 per cent rating to claim the gold award ahead of the NRMA and Kmart in the highly competitive car service category. The extensive survey covered 30 different service categories, with the strict proviso that respondents must have used a service within that particular category. Companies were rated on five criteria: personalisation, understanding, simplicity, reliability and satisfaction, with simplicity defined as making the process quick and easy for customers, and satisfaction as delivering on customer expectations. Respondents were asked to rank service providers based on their personal experience, including the quality, speed and ease of service. They were also asked to highlight service that showed genuine insight into their needs and where their expectations were met or exceeded. Toyota Australia’s executive director sales and marketing Tony Cramb said the award demonstrated the success of initiatives designed to provide customers – who Toyota refers to as guests – with a personalised experience that is exceptional. “Toyota has implemented a cultural shift throughout our company and dealer network to ensure we have an unswerving focus on treating owners and prospects as valued guests of the Toyota family,” Mr Cramb said. “As part of this generational change, we have implemented improved processes designed to ensure a more seamless and personal experience for each and every guest, from the moment they first visit us and right through their ownership experience. For the first time in the Quality Service Awards’ 18-year history Reader’s Digest held a gala presentation event in Sydney, saying Toyota’s gold award reflected the efforts the company has put into satisfying consumer demand for high service. The prestigious magazine award comes hard on the heels of Toyota Australia breaking all previous records with two-thirds of its entire dealer network being awarded the maximum five-star customer-service rating in 2015. These results were determined by independent surveys of owners about the level of satisfaction with their experience at Toyota dealerships during the past year. Toyota has been Australia’s best-selling automotive brand for the past 13 years. Reader’s Digest is one of the world’s best-loved magazines and is just six years short of celebrating its 100th anniversary. It has an Australian monthly readership of 877,000. Want to see for yourself? 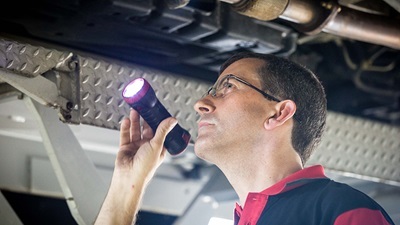 Experience the Toyota service experience by booking here.